Tactical Two Stage Trigger setup. 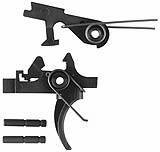 The 2 Stage Hook Under Trigger Set is designed for an easy drop in assembly. It implements a self-centering patented disconnector for a smooth even 4.2-4.6lb. trigger pull. All critical working parts are precision ground to ensure the highest accuracy. All parts are heat treated and case hardened by a Government approved facility. The 2 Stage Hook Under Trigger Set is designed for .154" pins.